The 2011 ToughKids Triathlon Championship Race took place on Saturday, September 10, 2011 at Croton Point Park, in Croton-on-Hudson, New York. The triathlon race consisted of a swim, bike and run event and was an incredible success with over 500 child athletes ranging in age from 4-14. This year’s race occurred on the eve of the 10th Anniversary of the September 11, 2011 attacks and paid special tribute to those sacrificed on 9/11, and those that are committed to preserving our freedom. 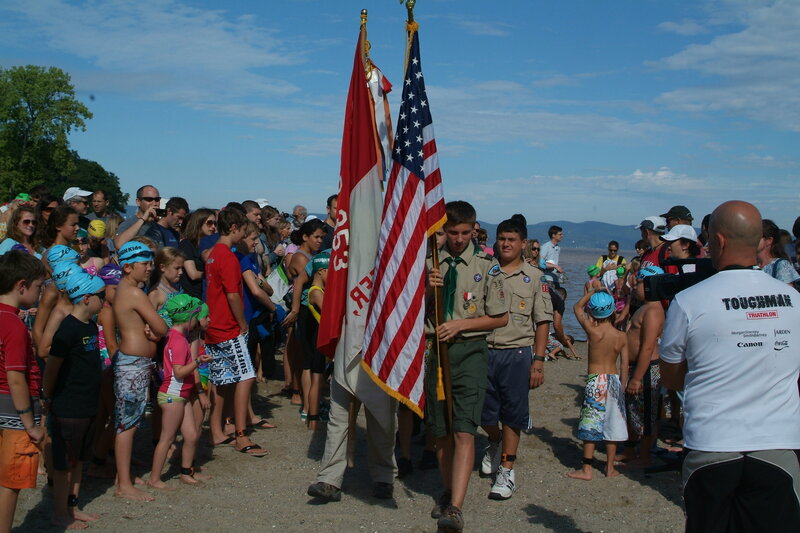 Troop 353 led by Will B., as part of his Life Scout Service Project, help organize all Troop 353 volunteers including participation in the opening ceremonies by presenting the colors, the Pledge of Allegiance and provided volunteer support throughout the race. In addition, Jack F delivered an inspirational speech honoring those lost on 9-11 and those that continue to fight for our freedom. Scout volunteers included Will, Jack, Jimmy F., Michael I., Chris L., and James T.. Scout athletes participating in the race included Jason C., Christian D. and Matt O. Great Job Scouts! Check out these terrific pictures!